Officials in Madison, Wis., are hoping to restore trust and repair community relations following an officer-involved shooting that left an unarmed teen dead, with the city’s mayor highlighting systemic faults that disadvantage young African-Americans. “There is no question that the system is kinder and gentler” to middle-class white youths, Madison Mayor Paul Soglin told RT's Manuel Rapalo. Soglin added that the city is experimenting with ways to keep young African-Americans out of the criminal justice system, by working with a municipal judge and setting up a “peer court” in one of the districts. Madison is also mulling the introduction of body cameras for police officers, though Soglin said this would not happen before 2016, adding that the decision is pending a study and budget discussions. “Reconciliation cannot begin without my stating ‘I am sorry,’ and I don't think I can say this enough. 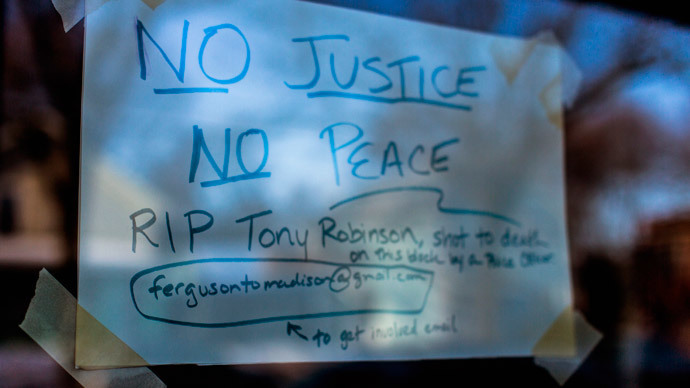 I am sorry,” wrote Madison Police Chief Michael Koval on his officialblog. Officer Matt Kenny shot and killed 19-year-old Tony Robinson after responding to multiple calls alleging Robinson’s erratic and violent behavior last Friday night. Kenny has been on the force since 2002. An internal affairs investigation was launched, and may take four to six months. Madison police have already been receiving racial sensitivity training, Chief Koval told the Wisconsin State Journal. However, though the city enjoys the reputation of a liberal haven with progressive politics, statistics indicate substantial disparities between whites and blacks on every level, from poverty and unemployment to arrest rates. On Tuesday evening, however, a cyber attack crippled city and county computers in Madison, with the hacker collective Anonymous claiming responsibility.